If the cruiserweight division were a person, it would barely be old enough to run for president. The WBC held the first cruiserweight world title fight on December 8, 1979, between Marvin Camel and Mate Parlov. It ended as a draw. Three months later, in March 1980, Camel won the rematch and became the world’s first cruiserweight champion. Camel dropped his new title in his first defense, to Carlos de Leon, the first cruiserweight champion of any note. Almost 37 years later, the division still struggles for recognition in the United States. It is hard for me to understand the reluctance of fans to embrace the division. Some of the most iconic heavyweight champions in history could have made the heavyweight limit. Rocky Marciano and Jack Dempsey always came in under 200 pounds. Joe Louis did consistently, early in his career. In an era of super heavyweights who stand 6’5″ or better and weigh in between 235-250 pounds, it makes sense to have a division for fighters who are too big to be light heavyweights but cannot weight much more than 200 pounds while training as elite prizefighters. The fact is, a well-conditioned, 200-pound professional athlete is both larger than a normal human being and also very agile and fast. In Mixed Martial Arts, the 205-pound, light heavyweight division is the glamour class. North American fans who ignore the cruisers are missing out, because the weight class has been red hot over the past two years. Poland’s Krzysztof Glowacki knocked out long-time champion Marco Huck, in one of 2015’s most exciting fight. Glowacki knocked down former champion Steve Cunningham four times in another shootout last April. Last September, Glowacki dropped that WBO belt to Ukrainian Oleksandr Usyk, a 2012 Olympic gold medalist and a potential pound-for-pound star. Usyk looks like a 200-pound version of Vasyl Lomachenko. 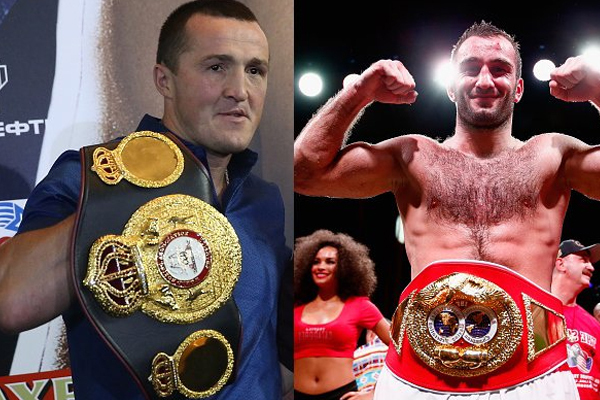 Another major cruiserweight fight is going to take place this weekend in Moscow, when WBA and IBF champion Denis Lebedev faces undefeated Murat Gassiev. In terms of resume, Lebedev would have to rank as the best cruiserweight in the world at this point, although at 37, he is growing long in the tooth. Gassiev makes for an interesting challenger. He is 23-0 with 17 KOs and is a rarity for a Russian cruiser–his last five fights were all in the United States. He is coming off from a knockout victory over 20-1 Jordan Shimmell, six seconds into Round 1. Gassiev is just 23 and stands 6’3.5″, with a 76″ reach. You have to expect he will move up and test himself at heavyweight at some point in the future. Meanwhile, a championship pedigree at cruiserweight would make him an instant contender at heavyweight, when the time comes.